DSR Members Deborah Bruno, Teresa Bruno, Jamie Presley, Tiffany Lewis, Bina Patel, Nancy Christie and Ashley Perrotti went through their closets to find clothing to donate to the New Jersey Chapter of Big Brothers Big Sisters. It was a great collection of over a dozen bags of clothing ranging from child to adults. Direct Sales Recruiting created a program that focuses on giving back to the community. 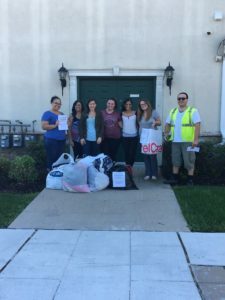 Organized by the President, Deborah Bruno reached out to the Big Brother Big Sisters chapter in New Jersey to let them know that her company had over a dozen bags of clothes to donate. The pickup was scheduled and a success. Thank you for contributions from team members Ashley Perrotti, Bina Patel, Deborah Bruno, Jamie Presley, Nancy Christie, Teresa Bruno making “Direct Gives Back” another successful event. Here is a little more about Big Brother Big Sisters. For over a century, Big Brothers Big Sisters has been helping change kids’ perspectives and giving them the opportunity to reach their potential. And we have over a century of volunteers, donors, and advocates just like you to thank. More than 100 years later, Big Brothers Big Sisters remains true to our founders’ vision of bringing caring role models into the lives of children. Today, Big Brothers Big Sisters currently operates in all 50 states and in 12 countries around the world. Locally, New Jersey is proud to have 9 BBBS Agencies serving every county in the State. Joining in a spirit of collaboration, these form the New Jersey State Association of Big Brothers Big Sisters Agencies. By working together, the BBBS Agencies in New Jersey have been supplementing the financial and organizational support each program needs to respond to the children on their waiting lists. More New Jersey children than ever before are benefiting from the positive impact of having Big Brothers or Big Sisters in their lives, but our work is not done. The New Jersey State Association of BBBS Agencies is focused on providing support so each agency can expand services to provide a mentor for every New Jersey child who needs and wants one. With the support of its corporate community and generous philanthropists, this vision can become a reality. Big Brothers Big Sisters agencies in New Jersey have serviced over 5,000 youth a year through mentorship. Each year we see an increase of approximately 15% of youth. Over the past few years, BBBS NJ has provided over $2 million dollars in grants to its local affiliates to provide mentoring services in their perspective communities.